Participating in study tours is an excellent way to immerse yourself in another culture. Realising the power of personal connections, AAS has arranged such tours for Balinese educators since its inception. Generally, the study tours are for 8 days and are arranged annually. Participants visit educational institutions and tourist hotspots and socialise with AAS members and supporters. Some Balinese student tours have been conducted by the Association but these are generally arranged at a school to school level. In March 2014, Alit Widia, who is an English teacher and coordinates the schools in his village of KabaKaba, visited WA for one month. He met staff and students and shared his culture with them at the following Schools: Landsdale, Bletchley Park, Morley, Allendale, John Willcock Community College, Geraldton, Bluff Point, Waggrakine and Mt Tarcool. Due to many changes with the airlines, unfortunately the group did not arrive until late in the evening of the 17th and were not able to commence any activities until Wednesday morning, when after a bit of a sleep in and breakfast, Derek Cromb accompanied them to Sculptures by the Sea. It was a bit of an experience, not only seeing the art but coping with the high winds and rain on Cottesloe Beach. We met the group back in Kings Park by the Bali Bombing Memorial and enjoyed lunch together, after which Wayan guided the group on a tour through Kings Park and back to the hotel. We met again for dinner at the Viet Royal which everyone enjoyed, especially Deidre Powell. 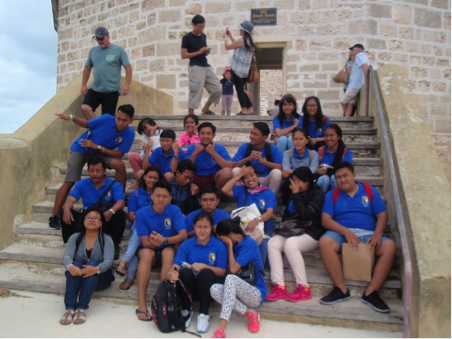 Thursday was a day at Belmont City College where the Bali students, in teams of two, joined regular classes of history, English, maths and geography, accompanied by a student guide from BCC. Later in the morning the SMAN1 Kuta girls presented a ‘Welcome Dance’ as part of the Harmony Day cultural exchange. All enjoyed lunch from the BCC Canteen, watched the Police Pipe Band presentation and joined some Aboriginal culture and art classes in the afternoon. After school it was back to the hotel for a rest, swim and get ready for dinner at The Han Palace in Bennett Street, East Perth. After which most walked to Victoria Gardens and enjoyed a very pleasant site seeing opportunity. The group were very taken with the clean water, streets and parks. Friday was an early start to be at Caversham Wildlife Park to feed the kanagaroos at opening time when they are really hungry. I think this was one of the highlights for the students. They also were able to touch the koalas, enjoy the Farm Show, meet the wombats and see lots of Australian animals and birds. By the time they were all hungry, lunch was ready at the BBQ’s in Whiteman Park. After lunch the group went for a visit to the Chocolate Factory where they not only sampled the chocolate and were able to view some of the process for making the products, but were able to try the icecream. There was a bit of skylarking with the girl’s hats and the students generally were a very happy group who seemed to enjoy everything they experienced. Once back at the hotel it was time for a short rest and head for the City for shopping and dinner at the Corner Café in Hay Street. On the appraisal sheets, the students voted this the best meal of their visit and I can say from experience that the manager and owner Sina Chon provides some exceptional fresh and tasty Cambodian food. It was a tired group that eventually returned to the hotel after yet, more shopping. Saturday was another early start when we met at Perth City Station for a train trip to Fremantle. Many of the students had not been on a train before this day and were very excited. Once in Fremantle there was time for a visit to the Council Recreational area, to have fun with an enormous lotto ball, visit Fremantle Football Club and watch part of the South Fremantle vs West Perth Colts match, shop in the markets and watch the busker juggling. By now everyone was feeling hungry so we headed for Cicerello’s at Fishing Boat Harbour. Everyone chose fish and chips in paper and a lot of hot spicy sambal was used during this lunch time. After lunch there was time to learn about the immigrants who were responsible for starting the fishing industry in Fremantle. The group once again was very taken with the clean water in the Fishing Boat Harbour, in which there was no visible rubbish floating. We then ventured to the new art exhibition on Bathers Beach before walking through the tunnel and visiting The Roundhouse. There was much frivolity as some of the students were locked in the stocks. After the Roundhouse it was off to the E Shed Markets for much souvenir buying. The markets were a big hit with the students. Later in the afternoon the group returned to Perth on the ferry up the beautiful Swan River. Once in Perth there was time to visit the Bell Tower and walk through Supreme Court Gardens. The ‘Farewell Dinner’ was held at The Royal Cambodian Restaurant and certificates were presented to all the participants. Enjoying dinner with the group were Susan and Derek Cromb, Sheila and Ted Hay, Deidre and Fred Powell, myself and husband Vic. After another walk along the river it was back to the hotel to pack for the 5am pick up to transfer to the airport for an early departure to Bali. SMAN1 Kuta have now become a sister school to the Senior School at Belmont City College and a two day visit is envisaged for Harmony Week in 2016. The BCC Junior High is sister schooled with SMP Kertha Budaya in Mas, Ubud and that will continue. It has been a very successful study tour in terms of new friendships and new experiences and the students returned to Bali happy, satisfied and very tired.